A totally unique sunflower! Tall straight stems are early flowering, producing unusual and attractive yellow blooms with amazing golden centres. 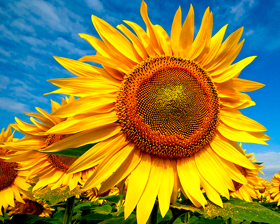 Each bloom is pollen free and 15-25cm in diameter, making spectacular cut flowers. Also adds height and interest to your borders. Sow seed March to May 12mm deep in well cultivated soil. Germination takes around 21 days. For earlier flowering: Sow indoors, individually in pots at 20-25C. When well grown, gradually acclimatise to outdoor conditions before planting out after all risk of frost.